Perhaps I should take it as a compliment that so many spammers want to sell their hair products, among other things, via the pages of JazzLegends.com. When I do my site devoted to men’s hair replacements, I’ll welcome them, but right now, if they–and they know who they are–continue, I can guarantee they will be made an offer they cannot refuse. I am purging the site of this garbage at least four times per day and have written personally to all the spammers, putting them on notice. And the notice is, if this continues, they will–and I promise this–be paid a visit. In the meantime, please, please, please keep using the community pages for your good dialogues, postings of videos, etc. And don’t forget, by the way, that if you want to hear something unreal, contact me directly at DrumAlive@aol.com about getting “The Gene Krupa Story” in stereo. And remember also that we are extending our MP3 sale for a bit. All titles, and there will be more, are $5. You can’t beat that with a stick. Or a spammer. The cases of the defunct, American drum companies–Rogers and Slingerland–represent, to me, two of the saddest and most disgraceful happenings in drum and in industrial history. For a company like Slingerland to go under, and this is an outfit that had both Gene Krupa and Buddy Rich as endorsers, is just unbelievable. They keep hanging on for some reason, though it is virtually impossible to reach anyone from Slingerland by phone, mail or e-mail, and their products are impossible to come by. Those in the know have continually pointed out that owner Gibson, the famous guitar manufacturer, could care less about drums and about Slingerland. The latest news in this dire arena has to do with the famed, Rogers drum company. I’ve said this before, and I’m certain many drummers out there will agree, that for many years, Rogers was the drum we all aspired to own at one time or another. They were, for a number of years, the absolute best in every sense. Careful listeners agree that Buddy Rich, Louis Bellson and many other famous Rogers players never sounded better on any instrument, and that the legendary Dynasonic snare drum was, depending on one’s taste, the best ever made. Rogers really began to come into there own as an industry factor when Henry Grossman purchased the company in 1953 and moved operations to Covington, OH. While the firm’s greatest years lasted until 1966, when CBS bought the company, Rogers still had a lot of life left within it in terms of the development of Memorilock hardware and other innovations that foreshadowed the era of extra-heavy-duty stands, pedals, racks and other hardware. After disastrous move to Monrovia, California in 1979, a brief move to Mexico the following year, and then a return to Fullerton, CA in 1981, things steadily went downhill. Rob Cook’s wonderful book on the Rogers drum company, published by his own Rebeats outfit, tells the painful story in grim detail. By 1987, Rogers had licensed their once-invaluable name to the Island Music Company, which solely functioned as an importer of drums with the Rogers name slapped on. What a lousy way to go. I often compare that scenario with that of the American automobile manufacturers who refused to see the handwriting on the wall, refused to acknowledge the rise and the quality of cars manufactured overseas, and in every sense, just shut their eyes in the belief that the party would never end. 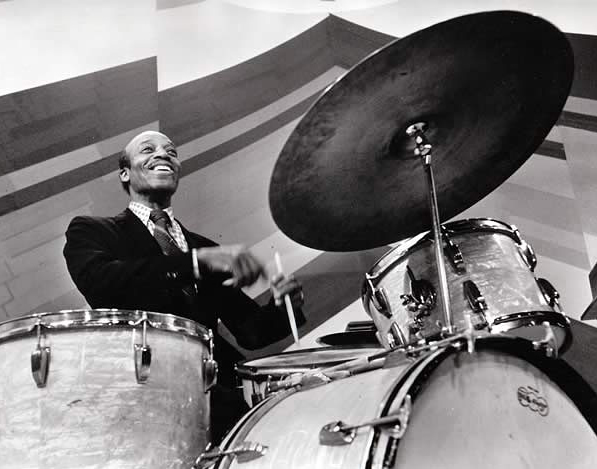 The unbelievable rise in the value and popularity of vintage drums, coupled with the success of American-made DW Drums, the resurrection of Gretsch and the popularity of various, American “boutique” operations, has forced the industry at large to take notice that, to some extent, what is old is new again. Say what you will about Yamaha drums. It’s not for nothing that their product is amongst the most widely used in the music industry. Yamaha drums and their many lines of percussion instruments are consistent in terms of quality and durability. Parts are easy to come by and customer service is great. And, they’ve marketed their name in such a way that Yamaha, in many ways, has become synonymous with the world “drums.” Yamaha’s crack marketing department has again stepped forward in a surprise and most savvy move: The drum division of the Yamaha company has acquired, as the announcement said, “the intellectual property rights” of the Rogers Drum Company. This means that Yamaha now owns the Rogers name, and their plans are to put out a line of Rogers drums. They’re smart at Yamaha. They know the value of the Rogers name. Those on e-bay know that, by and large, a vintage Rogers drum will get, at a minimum, twice as much as a Slingerland, Ludwig or Gretsch drum. Though I would have loved to see an American drum company acquire the Rogers name, and evidently, several have tried through the years, we can only hope that Yamaha will continue to emphasize quality as it applies to a line of Rogers drums. 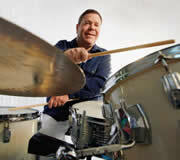 Perhaps Tama will now think about acquiring Slingerland. Someone should. We have written several times about the problems and complexities involved with our popular DVD title, “Tony Williams Live in New York City.” It seems that every other copy has been defective in some manner, and we’ve done everything within our power to rectify the problems. The last measure we took, believe it or not, was to acquire a copy of the original laser disc from Japan, and transfer directly to DVD from that source. Even that hasn’t worked. The good news is that we have been fortunate enough to track down, at great expense, the original VHS Video of the program, which is a very, very rare item (most of the issues were on laser disc). That will be our new source, and we believe this will call and end to all the problems. I cannot thank everyone enough for their understanding, and we have gone out of our way to make good with replacement, refunds, etc., on all defective copies. JazzLegends.com visitors are taking note of our acquisition of more and more Tony Williams titles. The good folks at Hudson Music and yours truly have recently made something of a minor breakthrough with the Williams family in terms of a cooperative effort to get some product out. We believe that it won’t be too long until we make a deal to do the DVD/Video tribute that Tony Williams sorely deserves. Our agreement with the Barcelona, Spain-based Fresh Sound records continues to move forward, and all of us look forward –if possible–to a Christmas release of the two-CD set of the Jazz at the Philharmonic concert from Hamburg, Germany, in February of 1956. Fresh Sound is a fine, fine outfit with which to do business, and I anticipate doing much, much more with them in the months to come. If it were not for Fresh Sound, hundreds of classic works of jazz, originally on LP and now on CD, would never have seen the light of day. Jordi Pujol at Fresh Sound deserves some type of award for his contributions to jazz and for making so much fine music available. EJazzLines.com, detailed below, has a complete line of what Fresh Sound has to offer as does WorldsRecords.com. The Gene Krupa pictorial book continues to do very well and continues to garner very positive reviews in the percussion press. Alfred Publishing is another great company in terms of honesty, integrity, openness to new ideas and ability and desire to communicate. These are, indeed, very, rare qualities these days. I am talking to Alfred about several new book and DVD projects. One recent idea that I’ve forwarded to Alfred (and they deserve an award in “Patience Department” for listening my endless lists of “new ideas”) would be a reprinting–in one volume–of several vintage Rogers, Gretsch, Slingerland and Ludwig drum catalogs, with additional commentary and photos by yours truly. Look at the prices that these catalogs get in the marketplace. It’s unbelievable, and I believe, I fine idea for a book. On a local basis here in the city of Philadelphia, I would be personally and professionally remiss if I did not mention the superb job that bassist/teacher/entrepreneur Bruce Kaminsky is doing in the Music Department of Drexel University. No, Drexel is not a music school, but with their very, very popular course of study related to the music industry, a full slate of music (which includes jazz) courses is imperative. Kaminsky is the inventor of the KYDD bass (the legendary hybrid acoustic/electric/unbelievably portable instrument), a world class bassist in just about every form of music, and my dear friend of over 30 years. Bruce is doing true wonders with his Percussion Ensemble class at Drexel, and I know this first hand, as I was a guest lecturer/instructor there yesterday. Bruce’s grand finale of the semester, a show to be done on Bruce’s usual grand scale at Drexel’s Mandell Theater, will feature the ensemble doing a singular version of none other than “Sing Sing Sing.” If things work out, and it looks like they will, the guest soloist will be yours truly. Now I know why I love Drexel.